My husband travelled to India back in May and, given my love of cookbooks and food writing in general, brought me back a couple of books that I have been making my way through. I just finished the first one called India on my Platter. It is by Saransh Goila who basically won India’s version of Top Chef called Maha Challenge back in 2011. After his win, he hosted a food travelogue show for the FoodFood network in India where he traveled 20,000 km through the subcontinent tasting the delicacies of each region. It was fascinating for me to see the breadth of Indian cuisine covered in this book. My only gripe is that many of the recipes included are not of the native cuisine that Goila is eating but rather his spin on the local flavors. Nevertheless it was a great, light read and totally transporting. And it gave me plenty of inspiration for what regions to visit on my next trip back to India. It also gave me some much needed cooking inspiration. 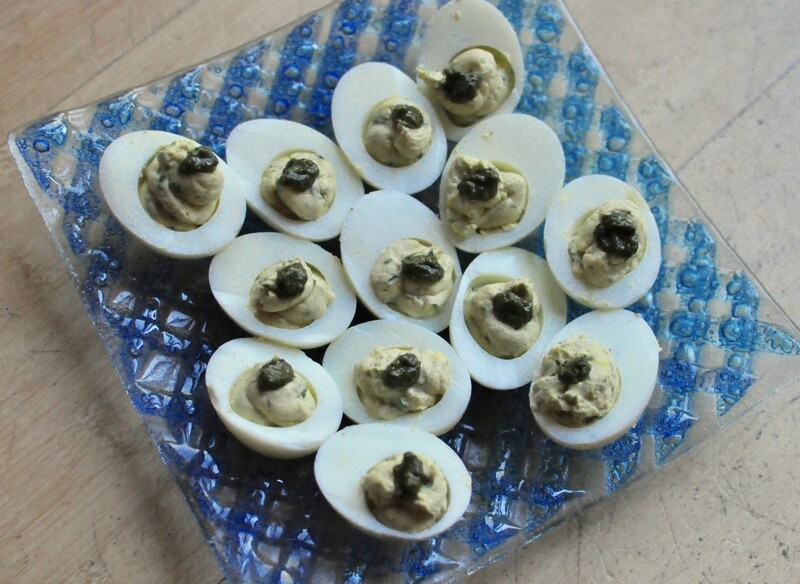 Goila makes an Indian spiced version of deviled eggs in the book for one of his many meal hosts and I thought this was a brilliant idea. His version included harder to find ingredients like green mango and garlic mayonnaise. I decided to come up with my own, simpler version. It helped that I was also fishing for a good recipe to serve to guests at tea time that packed some protein and eggs are perfect. They are fairly easy to make and can be served at room temperature which is a double bonus. My love affair with chaat masala is well documented on this blog (see my latest chopped salad post to start!) and, of course, I thought eggs would be the perfect vehicle for its tangy, piquant flavor. My filling was a quick mix of mayonnaise, lemon juice, chaat masala, plus finely chopped cilantro and scallion with the egg yolks. I gilded the lily by adding a small dollop of cilantro mint chutney on top of each egg which also made for a festive presentation. These babies disappeared fast and were a lovely addition to a tea time spread that included samosas and pakoras. Somehow they managed to balance all the fried goodies! Plus they are prefect for this season of picnics and BBQs as an appetizer or addition to a potluck. Or you can just keep a stash in your fridge for breakfast like I want to do….I won’t judge! An Indian spin on the classic, this version of deviled eggs included the tangy spice blend, chaat masala. After ten minutes, drain the eggs and submerge in cold water to cool. If you are in a hurry, add ice. Once they are cool, peel the eggs and cut each egg in half. Put all the yolks in a small bowl. Add the mayonnaise, scallion, cilantro, salt, chaat masala, lemon juice, and jalapeno if using. Mash everything together with a fork until it is a uniform consistency. Taste and see if the salt is to your liking. Take a plastic sandwich back and fill the bag with the yolk mixture. Snip off one of the corners to reveal a 1/2 inch opening. Fill each egg white half with the yolk mixture using the bag. If you are comfortable with pastry bags, you can also use one of those for this step. I am an icing novice and prefer the simplicity of a regular old sandwich bag. If desired, put a small dollop of mint cilantro chutney on tope of each egg half. Eat with abandon.